The New Genie LED Garage Door Opener Light Bulb is rated to last 25,000 hours and carries a 3 year warranty while only drawing 10 watts. This energy efficient 800 lumen bulb is made specifically for garage door openers and is built to withstand the vibration and shock that wears out normal light bulbs. This is the best light bulb for your garage door opener. Recent changes in technology have brought us the CFL light bulb and the long lasting LED bulb. While these options offer superior longevity, most people don’t know these lights can emit a frequency that will interfere with your garage door remote. We first saw this issue with CFL “pigtail” light bulbs and now we are seeing it with different types of LED bulbs. Genie Company has released a new Garage Door Opener LED Light Bulb to help eliminate this issue. This new exclusive radio frequency friendly bulb will help eliminate or reduce opener remote interference. The light bulb is designed specifically for garage door openers and is compatible with most remotes. This will eliminate interference between your remote and garage door opener so as to ensure you have the best range from your garage door remote. This new Genie bulb is also vibration and shatter resistant and designed to withstand 5G of shaking force. Standard light bulbs don’t have a long service life in garage door openers due to the negative effect the vibration has on the bulb filament. This results in the home owner having to replace bulbs frequently. Moisture and temperature can have a negative effect on light bulb performance. The new Genie Garage Door Opener LED Bulb is rated for damp environments and temperatures down to -22F. This will guarantee great performance in cold damp locations. 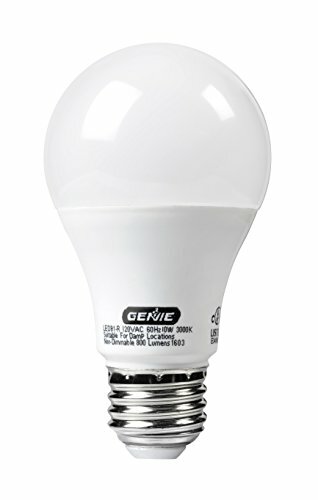 The new Genie LED Light Bulb only uses 10 watts of power while outputting 800 lumens of light. It has been designed to last 25,000 hours and carries a 3-year limited warranty. The new bulb will work in any brand of garage door opener. The base of the bulb is narrow enough to sit all the way down in the light socket eliminating the issues found with wide base energy efficient bulbs. You can read more about that issue here. Operation is limited to the standard on and off… the bulb is not compatible with a dimmer. Your garage door opener remote might have a reduced range due to interference or it could be another issue. If the range is getting worse, try replacing the remote battery. Try several different batteries to make sure the first battery isn’t a dud. This will eliminate the most common problem with range being limited. If you are still having issues after changing the battery, your circuit board could be the problem. Some garage door openers have the remote receiver built into the main logic board and others have a separate receiver board. If you see two boards and one has a long wire hanging down, this is the receiver board. When this board goes out, all remote accessories including your outside keypad will not work. Energy efficient light bulbs contain circuits that can emit a frequency that will reduce the range of your garage door remote. The first thing most homeowners do after having a garage door opener installed is put in an energy efficient light bulb. What they don't realize is the new bulb could be reducing the range of their remotes. Minnow bucket aerator motor was emitting a constant frequency that would prevent the remotes from working. A customer had a minnow bucket in the garage that was constantly running. The motor was causing interference with the garage door opener. Crazy! The NSA building was emitting a frequency that effected Genie garage door openers in a large part of the city. External receivers had to be installed that used a different frequency to solve the problem. Home owners would come home and there garage doors would be wide open with no explanation. The NSA was not only triggering the opener to open and close, it was causing interference with remote range as well. With the growing popularity of LED Christmas lights, some home owners are seeing issues with their garage door opener around the holiday season. This is due to the fact that many LED lights emit a frequency in the range that most openers use to communicate with wireless remotes and keypads. If you think this is the problem, unplug your LED Christmas lights and see if the issue goes away. A customer had a remote down in the bottom of a Christmas decoration box that was emitting a frequency because a decoration was laying on the remote button. We had to find the problem with a frequency sniffer which took some time. We originally had thought the circuit board had gone out on the unit which is usually the case when you have to put the remote 6 inches from the circuit board to get it to activate the unit. The funny part is the home owner had been having this issue for two weeks and the battery in the Christmas remote did not die. Give it another week and the problem would have probably gone away on its own as the battery expired.